We've been reading lots of pumpkin books lately, so when I saw these felt Jack-O-Lanterns posted by Heather on Camp Slop. She made hers into a game, but I wasn't feeling quite that ambitious the morning I made these. 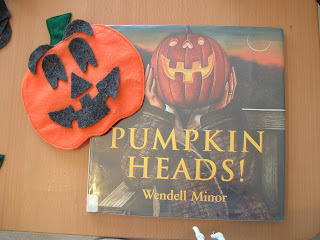 We did read the book Pumpkin Heads by Wendell Minor which is a really fun book. 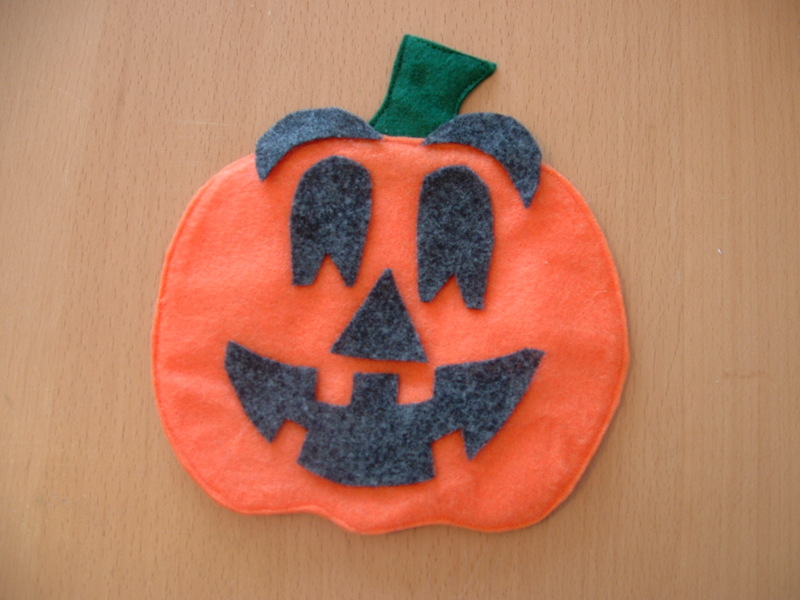 It's got simple text and is a Halloween book without being too spooky. I also had the kids look through the book for ideas to carve onto our pumpkins. 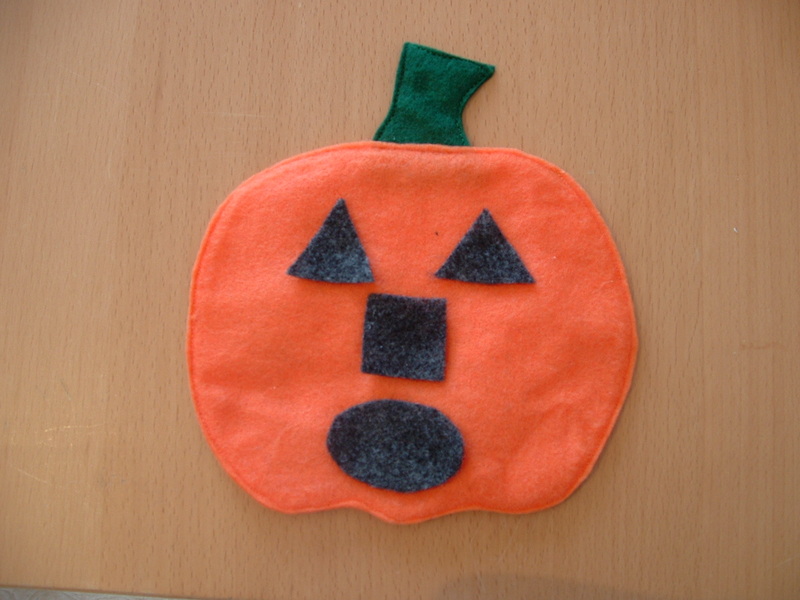 To make them, I just sewed two pieces of felt together to make the stem and then stuck that between two pieces of felt and sewed around the edges to make the pumpkin. There's no reason these need to be double-sided though. Then I cut an assortment of shapes out of black felt. 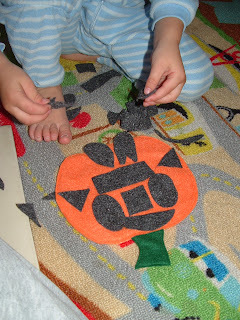 Some of them were basic shapes to help the kids practice naming them and some of them were just for fun for making Jack-O-Lanterns. Sweet Pea's had more of an abstract (Picasso maybe?) look to it. Yeah, I know her outfit is a little weird...she insisted on wearing that red T-shirt which I had out for turning into Little Brother's costume. Any guesses what he's going to be? ...because neither of them wanted me messing with their pumpkin. Now they're bagged up to save for a day or two when I need a fun activity again, and they'll be "new" again after not being seen for a few days. Oh, I need to do that. Why don't I remember simple things like that in time? Picasso, yes for sure. Great activity! Fun! 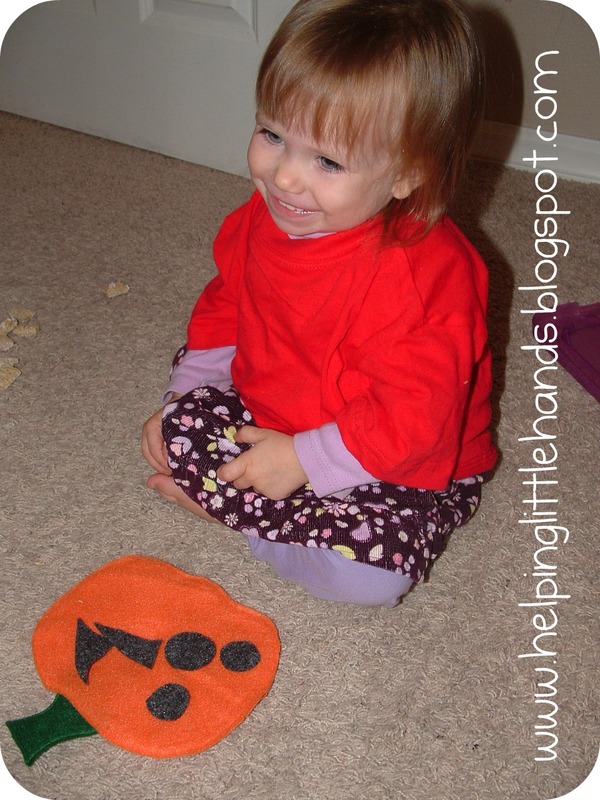 I rotate our toys and activities, too!